I had a reminder through some recent comments that people view locking cadences in step as a means for optimizing the whole of the system and not for individual teams (by allowing them to choose the cadences at which they wish to deliver). this is used to justified in the case of when you have a need for a program. I think this is missing the point, so I am going to go through some explanations. I really like how Jurgen Appelo has applied David Snowden’s Cynefin framework to work systems so I am going to illustrate my rationale using some of his work. 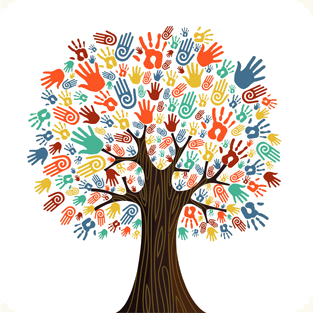 Teams are simple to understand, predominantly because of their simple structure with few people; however they are complex in nature because we are dealing with humans. 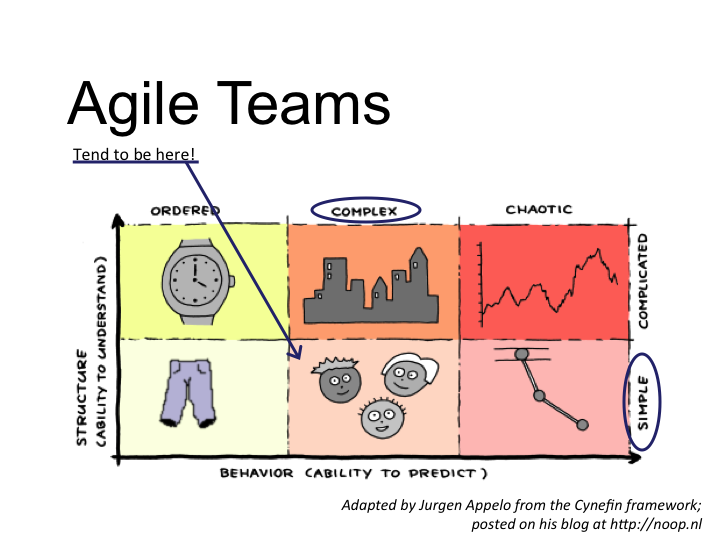 Sometimes we can’t even predict our own behavior, much less a whole team’s. 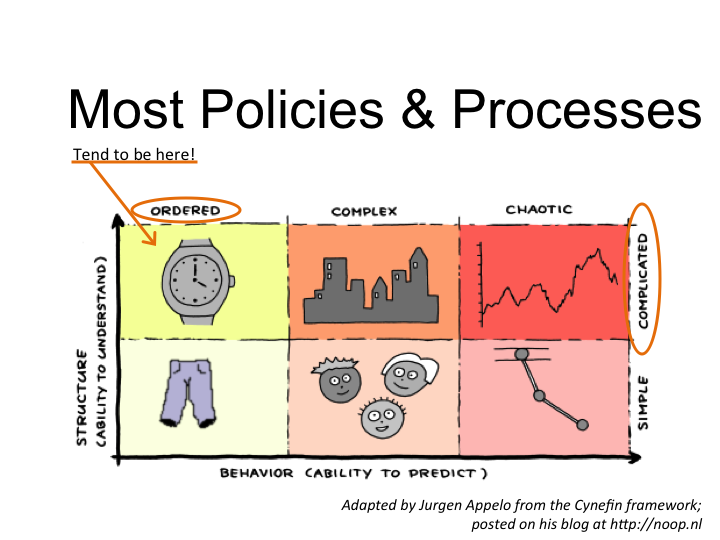 Next, let’s think of where most policies and processes wind up… Good processes (and their accompanying policies), try to add order into systems; this is particularly true of many of the scaling systems out there (SAFe, DAD, to some degree LeSS) where structure and process is imposed on the ‘program’ system in order to achieve more predictability. Unfortunately most of these are quite complicated in nature; some have helped by providing well diagrammed (some even animated) pictures, but there is still no denying the complicated nature of their arrangements to attempt to get predictability. 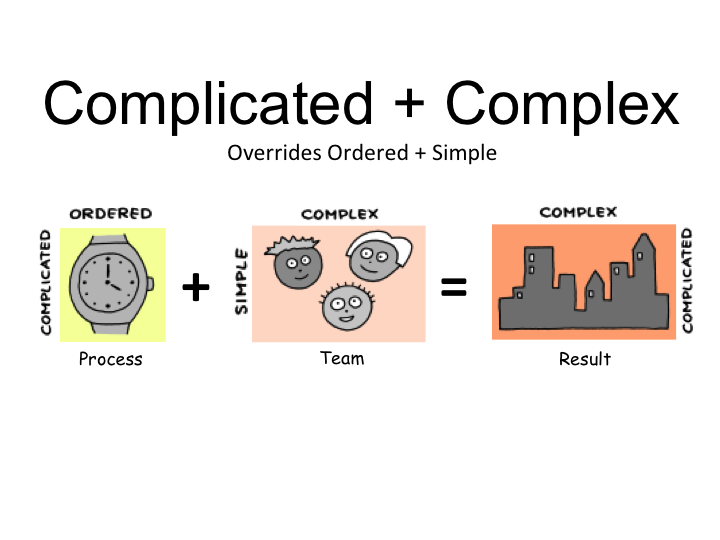 The complicated-ordered process thrown on a simple-complex team yields a complicated-complex result. This isn’t achieving what we wanted… and we’re just talking about a single team! And if we expand this to many teams such as we would have in a program, this is the best case we can hope to achieve. It may become complicated and chaotic as the additive results yield less predictable results. So why is this happening? It’s because we humans create complex social systems. 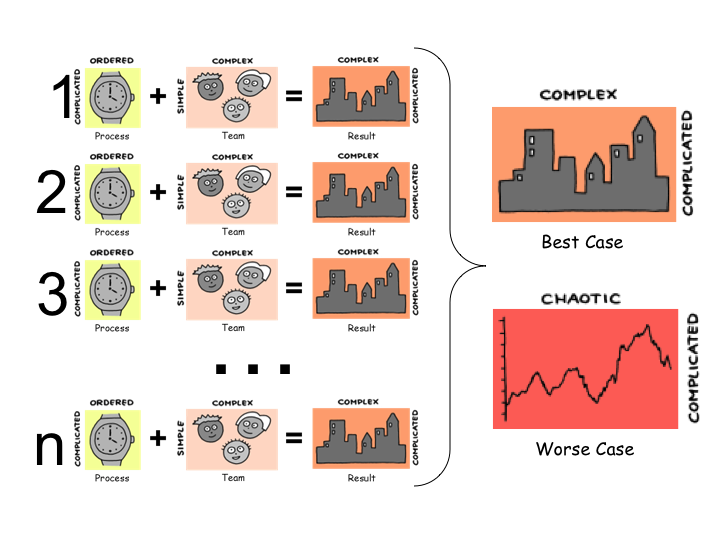 There’s a reason why we value individuals and interactions over processes and tools; the latter can be complicated in nature perhaps and yet they are ordered in nature, while people systems can be either simple or complicated, yet are always at best complex. People aren’t robots, so our behavior is never entirely predictable. And yet… we try and put systems in place that have unintended consequences, such as imposing cadences on teams to get more order (predictability) out of them. 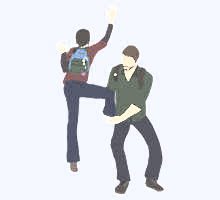 Think about the last time you had something forced on you that you disdained; it probably had you at best working at less than motivated – it sucked the motivation out of you, so you didn’t perform as predictably as desired. And at worst case, you went and found a new job and now the team was thrown into reforming and restorming to get back to renorming and performing. Each team and its individuals will be different, perhaps some won’t care that much about the ‘normalization’ of cadence. But some will have deep negative impacts that will occur. So I ask you what ‘system’ are we trying to optimize? The process or the people? Imposing a process to de-optimize how humans perform seems to me have many potential negative longterm effects; besides losing good people or demotivating people, even if this happens to only one team out of ten, it sends a signal that people don’t control their work system at all, that any element can be changed on a whim. 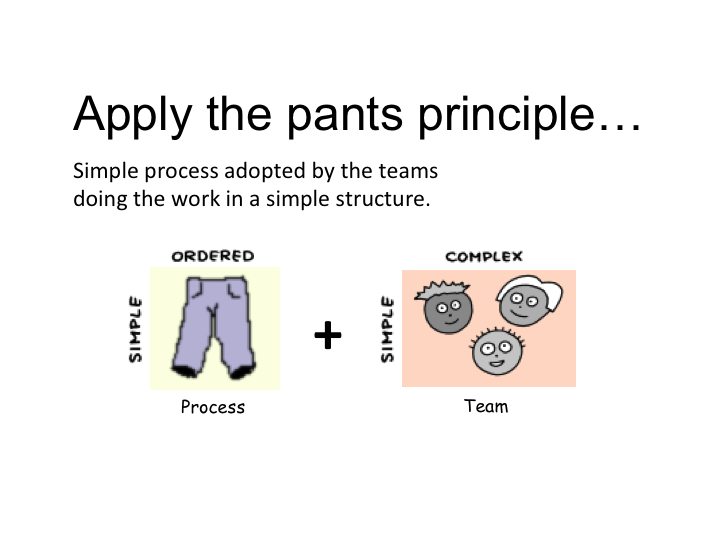 Basically apply the pants principle and let teams adopt as simple a process as possible, including the orchestration. As Saint-Exupery said, simplicity is not achieved by deciding on not when there is more to add, but deciding on when there is not more to take away. Does this mean that locking cadences can’t ever be adopted? Not at all… Facilitate teams to select a good cadence within themselves firstand then collaborate with other teams to find how to best orchestrate delivery. This may result in lockstep cadences or perhaps a creative branching and merging strategy. This could be done during team chartering by holding a futurespective. 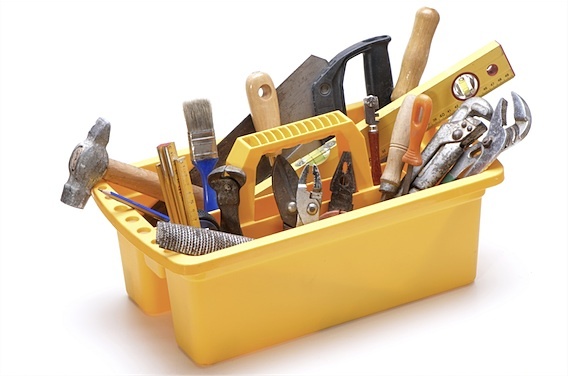 Regular intra-team retrospectives could help teams identify when changes need to occur. Simply installing a locked cadence at the beginning may result in a sub-optimal approach as it overlooks the people part of the equation. We discussed many different things, and I’ll mostly focus on my take aways and contributions. We’re still discussing this (primarily via twitter currently), so it’s an ever evolving concept and I am not sure we’re all in agreement yet. Happiness was felt to be a short term thing, while Joy yielded a long term gratification. I started my (useful) input showing how happiness of a team over time can be captured via a Niko-Niko calendar and that this is useful in understanding whether a team is working well together. Ryan still said that a happy team may not be joyous, but we did at one point all seem to agree that at some point if a team had little to no happiness occurring, then it was unlikely they would feel joy. This got me to drawing a stacked area chart; the x-axis is time and the y-axis is the amount of joy felt by the team. 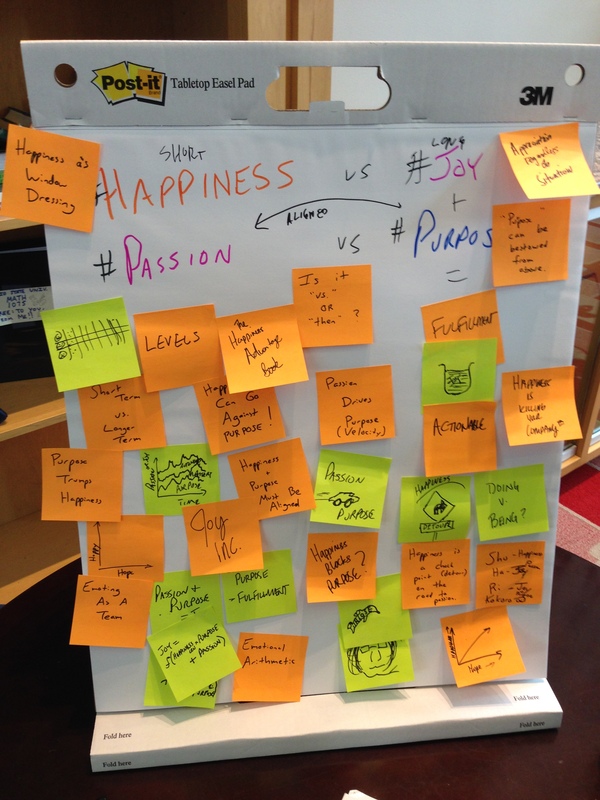 The areas that add up to this happiness (which is more volatile), passion (mildly volatile), and purpose (little volatility). I wish we had spent more time coming to some form of agreement on Passion and what it means; I defined Passion as the collective sum of the motivations I have. I really like the CHAMPFROGS set that Jurgen Appelo has created. I think some of the inconsistencies showing up in our Twitter convos deals with each of us having a different mental model around passion. These passions can change some over time. This equation states that Joy is a function of the Length of Happiness I feel multiplied in the pursuit of Purpose in addition to the Passion I bring to it. Thus if I have little time I spend feeling happy as I pursue a purpose, then I will not feel longterm Joy. Likewise, if I have no purpose, I also get no Joy either; this because Joy is the feeling of Fulfillment we get (Joy = Fulfillment). Lastly, it needs to be aligned with passion as if my passion would rather pursue something else, then I likewise will have little Joy. If we bump this from an I to a We for a team or organization, it means getting alignment on purpose and passion while having a supportive environment which increases happiness. The important aspect to me though is the role of leadership in this; when exercising leadership, our job is to discover people’s passions, help them see how they align with a collective purpose. It also means that I want to create this supportive environment, but not pursue short term hygenic treatments to make people happy, they need to be factors that create longterm possibilities for team members to be happy. 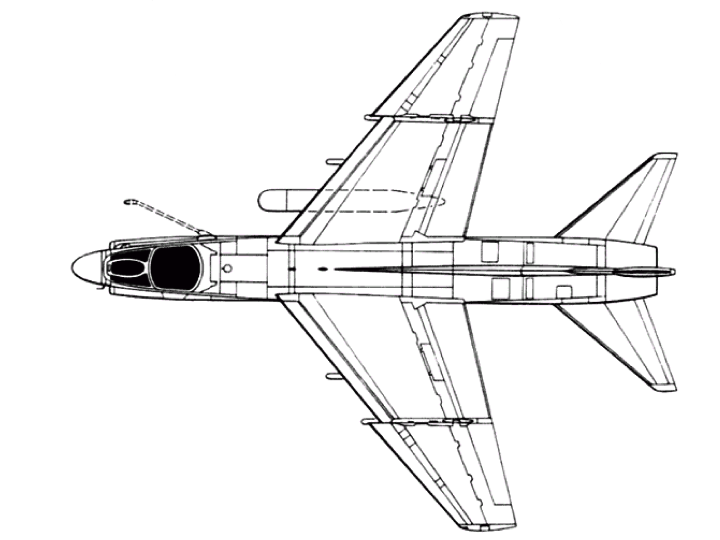 An example of a longer term factor would be one of safety as one would find in Anzeneering. To create Joy, leaders (which in a self-organizing team can actually be any team member) is the application of the Antimatter Principle to attend to people’s needs. Addition (that I forgot to mention, but it was discussed and is very relevant), Tobias Mayer has an excellent post that if you attempt to encode someone’s values, you kill that person’s spirit. This can be true even what is being imposed is happiness; this will not create longterm Joy. When leadership is based on power, this promotes hierarchical formal power relationships; only so many can report to a leader under this arrangement. An organization may choose a flatter structure, but ultimately decision-making authority rests in appointed or elected people at the top of a pyramid structure. Only people in these positions get to wield authority. When directing is the preferred mode of operating, there is a limit to how many directors one can have. So even though a Utopian Benevolent Dictatorial Leader wants to help others, there is very little room for others to lead in their viewpoint. They have a sincere belief they know what is best. 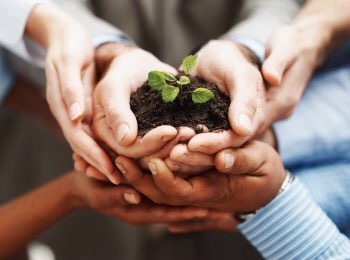 In “Becoming a Technical Leader: An Organic Problem-Solving Approach” by Gerald Weinberg, he talks about how anyone can become a leader through helping others. This is at the core of Servant Leadership and when this is done in a participative manner, it becomes facilitative in nature. Leadership derived in this manner happens irrespective of what formal structures are in place. Everyone has expertise and can lend assistance in some area and thus at any time one can be a leader; authority is derived from people’s sustained willingness to follow. 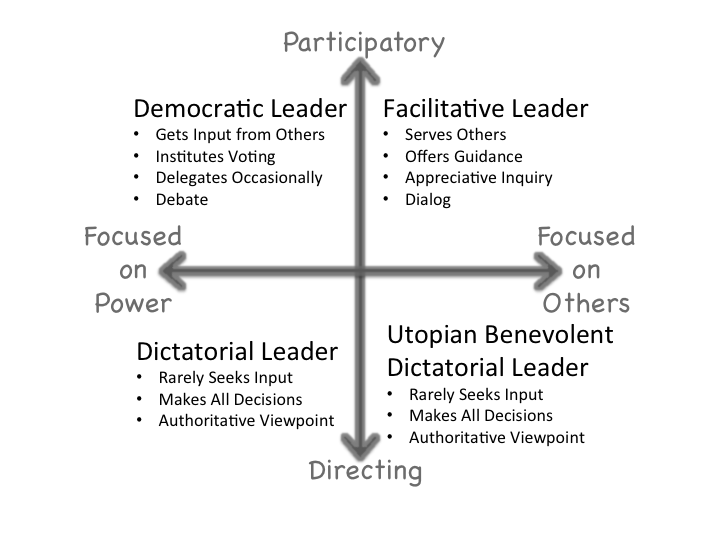 Leaders that then get appointed or elected to some formal authority role (supervisor, manager, etc.) that were already using a facilitative leadership approach gain much more capacity to get things done; people were already willingly giving them authority, the new position just confirms that belief. As long as the individual doesn’t switch too far to other extremes in the dimensions, they should be able to sustain this willingly given authority.